Trust your dog, don’t control him! Lizzie had recently retired from a responsible position. She lived in a spotless and perfectly-kept home in the countryside with a husband who was always out at work. She wanted a dog for companionship and pleasant country walks. Her children were long grown so it was a good while since she’d had a young thing to look after. So the advent of her puppy Bracken brought up all kinds of fears and anxieties in Lizzie - she was terrified something dreadful would happen to him, but she also struggled with the disruption a puppy brought to a neat, clean, adults-only, house. At Puppy Class, Bracken was distracted and lively - typical of his busy and active breed - not, perhaps, the best choice for a first-time dog-owner of later years. Lizzie got very anxious and embarrassed by his behaviour at class. She felt ashamed that she couldn’t “control” this puppy, and felt he was showing her up. She was perplexed that her image of the perfect dog trotting at her heels across hill and dale was not matched by the reality of a puppy who seemed to be always straining to get as far away from her as possible! So I wasn’t surprised when Lizzie got in touch with me a couple of months after her Puppy Course finished to give me a long list of problems she was having with Bracken, and to ask for help. When I arrived at her home I found something more akin to a prison! I was ushered through an airlock of two doors at the front door (a good practice in itself) to see an excited puppy leaping up at a baby gate. Bracken was not learning how to greet people stuck behind a gate! She had four metal playpens barricading various rooms and corridors. She had baby gates in most of the doorways - this in addition to a couple of crates. And outside she had had fencing built round the patio to prevent Bracken’s access to the garden. The house itself was spotless, with no sign of Bracken’s toys which had all been put away. Her focus was entirely on containing and controlling her eager youngster. This is what made Lizzie happy! Here's a taste of the course that Bracken got - specially-selected video lessons will get you fast results! Over the course of a month - with much reassurance that Yes, Lizzie was an excellent owner for Bracken, and Yes, she could look after him well and give him what he needed, and Yes, he would become her perfect companion over time - all the playpens, fences, and gates disappeared. She became able to walk him on a loose lead instead of the vice-like grip on a tight lead she had before, and she was able to let him loose on walks without panicking that he’d escape (or even want to escape). She had entirely stopped chasing Bracken for stolen items, with the result that he no longer bothered to steal them - he’d much rather have the offered game instead. Bracken was a grand little pup who was being wound up on a daily basis with constant nagging, recriminations, and control. He was simply exhibiting puppy and early adolescent behaviours which provoked a huge over-reaction in Lizzie, owing to her anxiety that she was somehow failing the dog. Once Lizzie learnt how to relax and release - and to stop worrying herself into a panic - everything started to run smoothly. By relinquishing control and instead giving Bracken choices, she elicited really good responsive behaviour from him. It was a delight for me to see that both Lizzie and Bracken felt free to trust and enjoy each other. The journey could now begin! 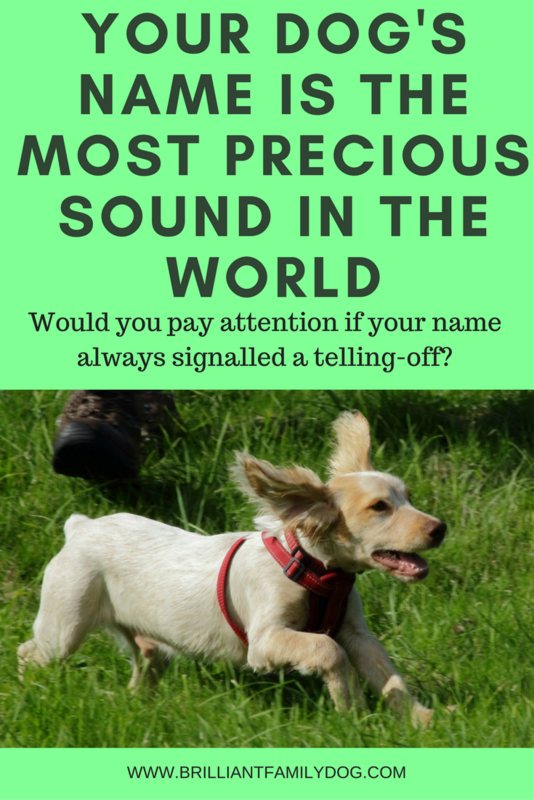 How precious is your dog’s name? Call your dog - go on, call him now. Did he look up with pleasurable anticipation? Did he come to you? If not, try again - and listen to yourself. Would you come if you were him? Dogs are simple creatures. They do what works. And they learn fast. How many times did you have to put your hand on your cooker’s hotplate before you decided it wasn’t a good idea? Just the once, I’d guess! So if you call your dog and when he arrives you lean over him and say, “WHAT ARE YOU DOING YOU HORRIBLE DOG I’VE TOLD YOU NOT TO DO THAT NOW LOOK WHAT YOU’VE DONE,” how likely is it that he’s going to come next time? 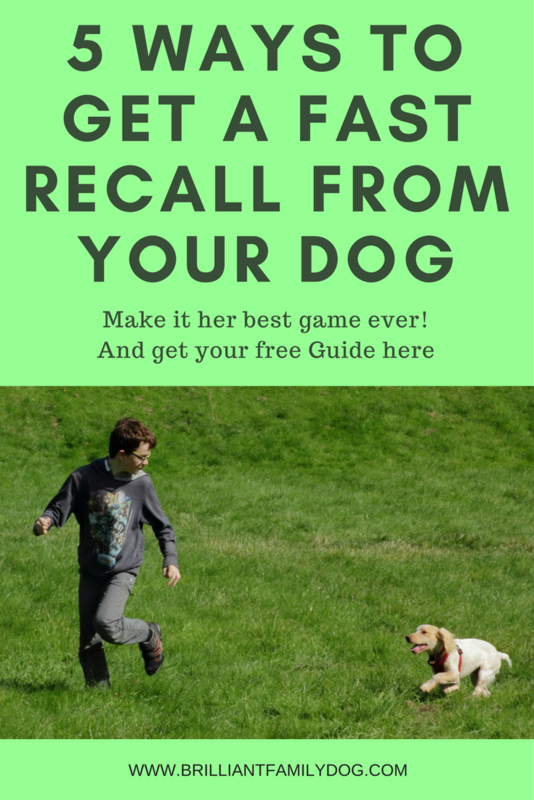 So while we need the patience of a saint not to over-react sometimes in the stress of daily living, there is one thing we can change so that we aren’t blitzing our dog’s recall. To his ears it should be the best sound in the world - especially coming from your mouth. Only use your dog’s name when you can pair it with good things. That means, “Fido!” — “here’s a treat for you”, or “Fido!” — “what a lovely doggiewoggie you are”, or “Fido!” — “let’s put your lead on for a walk”, or “Fido!” -- “here’s your dinner”, or “Fido!” — “grab this toy!” … you get the picture. When you’re frustrated or short-tempered, you find your new shoes have acquired decorative toothmarks, you need to interrupt barking in a hurry - you DON’T use his name. What do you use instead? Absolutely anything you like. From “Dog!” to “Sausages!”, from “Woowoohoo!” to “&**$^**£*!!”. Whatever you call, don’t call his name. 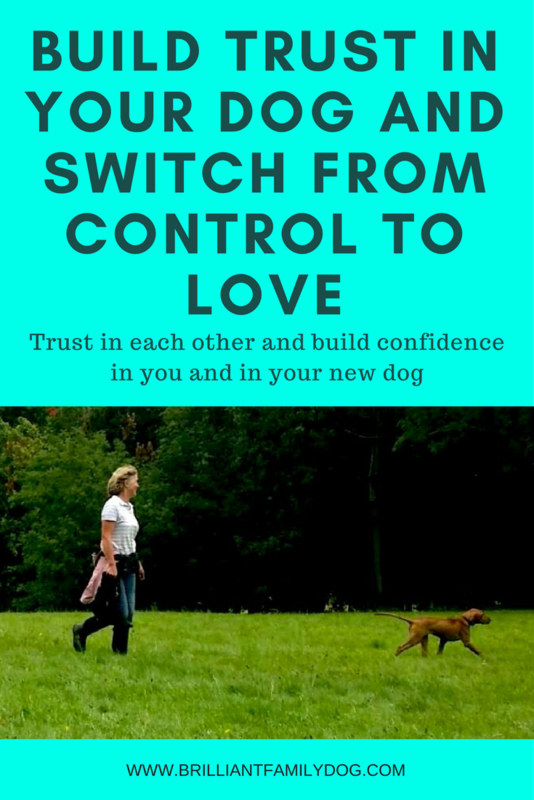 If, upon sober and honest reflection, you realise that you have been colouring your dog’s perception of his name - and I know how easily this can happen, especially when you’re running a busy family - fear not: you can change it all. As I said above, dogs are simple creatures. They do what works. And they learn fast. Simply ensure that you follow 1) and 2) above. Focus on it religiously for three days and see where you are. I’d like to hear your results! By the way, often all you need to do to prevent your dog doing something you don’t like is to distract him by calling his lovely name. No need to stress yourself out by remonstrating with him. There’s no place for Victorian morality in working with your pet! Get the result you want and move on. 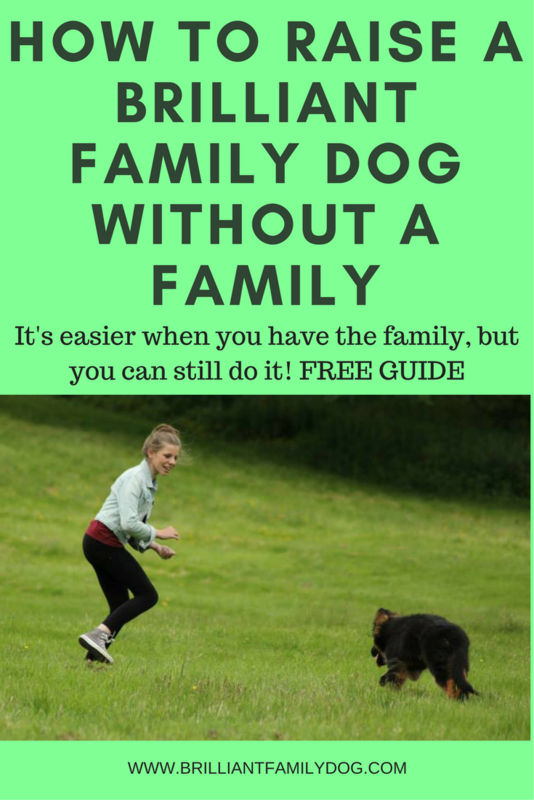 Want to know how I train my own pups? get our free email course here!